The Grove Park Inn in Asheville, North Carolina is excited to announce this year marks the 20th year of National Gingerbread House Competition, from November 20, 2012 to January 2, 2013. This wonderful display of art can be viewed Mondays - Thursdays from 8am to 11pm, except for Christmas Eve and Day and New Year's Eve and Day. 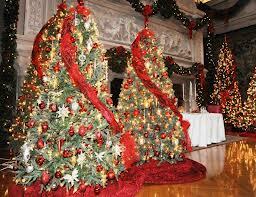 In addition to the gingerbread creations, you can see over 80 decorated trees in this grand, historic hotel. The grand prize winning entry and other selected gingerbread winners will be removed the third week of December from the display and moved to New York City for a 13th appearance on ABC's Good Morning America. Contestants come from all over the country bringing their constructive gingerbread masterpieces to this event.